At the beginning the program asks the user to enter the name of the archive that should be recovered. You can either select the file using the standard Open File dialog box or select it from the history list. In this step the tool scans the archive and displays the list of files in it. The time needed to scan an archive depends on the size of the archive and on the performance of the computer. After the tree of folders and the list of files are displayed, the user needs to select data that should be recovered. 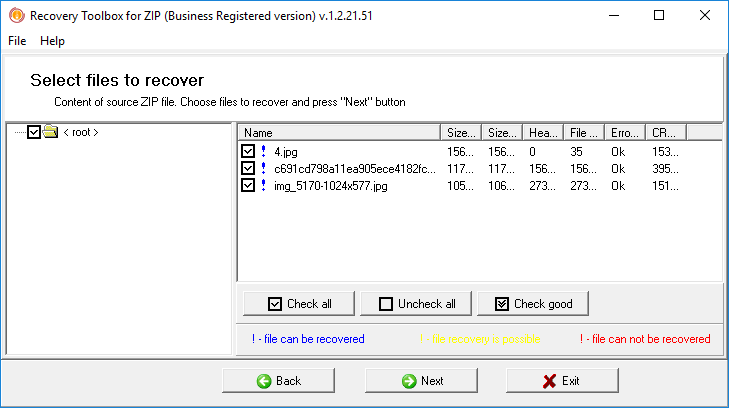 After that he can manually select the folders and files or click the Check All button in order to select all files or the Check Good button that will select items that can be correctly recovered (the program determines the possibility of correct recovery while scanning the archive). The Uncheck All button clears the selection of all items. A blue exclamation mark (!) means that the file will be recovered. A yellow exclamation mark (!) means that recovery is possible. A red exclamation mark (!) shows that the file can't be recovered. 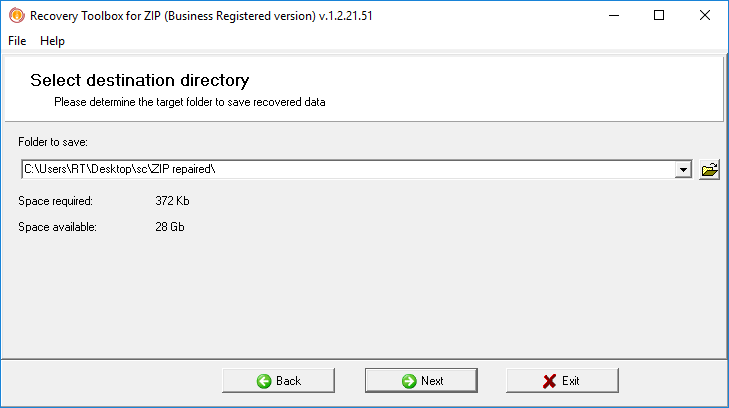 In this step the user is supposed to select the folder the recovered data will be saved to. 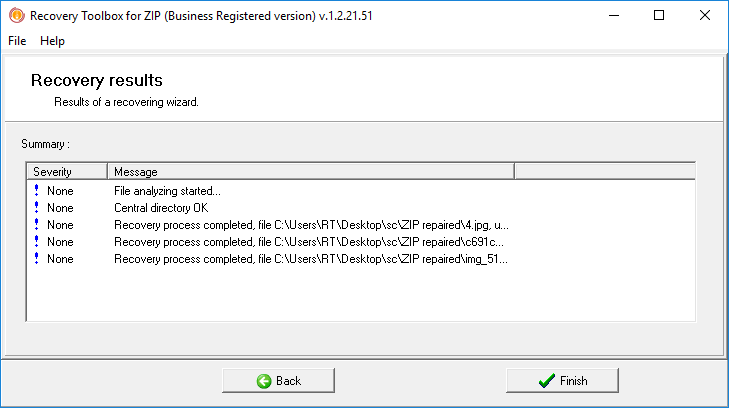 It is possible to select the directory using either the standard dialog box or the history list. 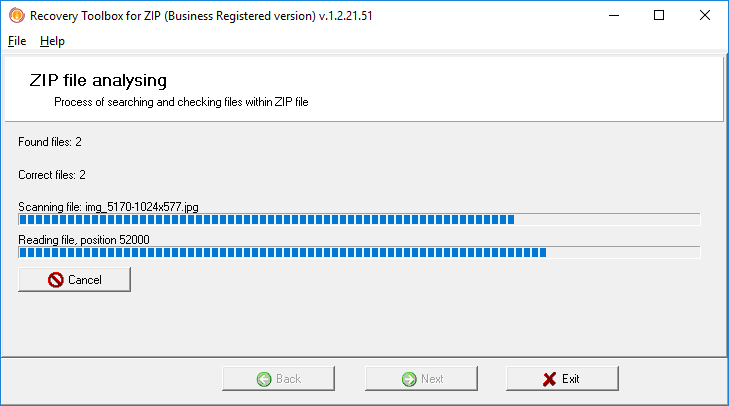 By default, the tool saves data to the ZIP repaired folder located in the directory where the source ZIP archive is stored. In the last step the program extracts data from the corrupted ZIP archive and saves it to the folder selected in the previous step. After that the user can see a report about the procedure. 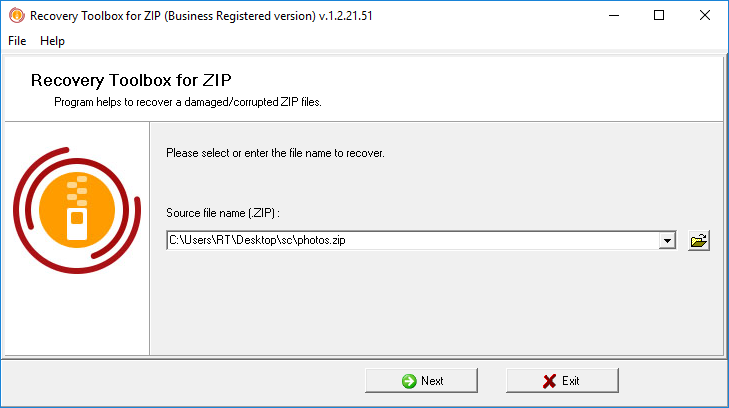 Notes: Recovery Toolbox for ZIP is a shareware product. Unregistered users cannot save recovered data to the disk.